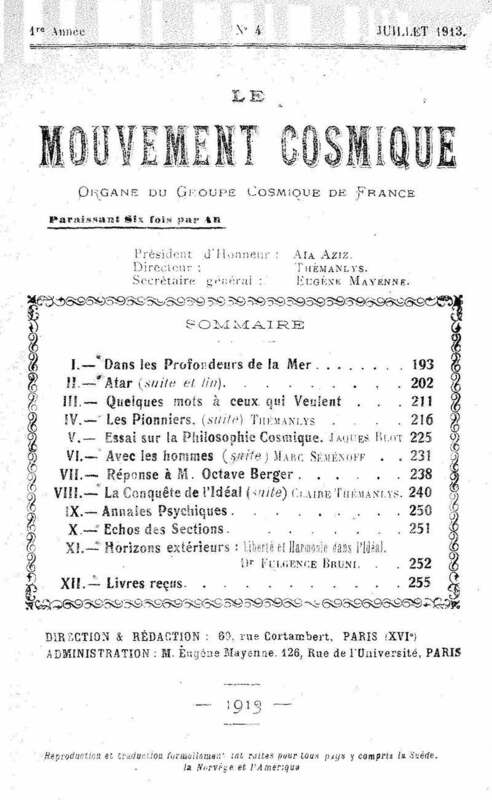 Organe du Groupe cosmique de France. Corporate author: Cosmic Alliance of France6 francs, 64 pp. Noted in World's Advance Thought, 1913. Issues published in 1913, 1914 and 1920, the last after Art, Science et Peuple had ceased publication. Organ of the movement started by Max Theon and his wife and continued principally by Themanlys, who later published Ideal et Realite and Art, Science et Peuple. Contributions by Jaques Blot, Marc Semenoff, Clair Themanlys, Fulgence Bruni and others, and regular teachings and occult novelettes from Theon. BNF; BM Lyon.